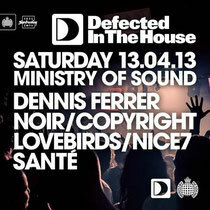 Defected In The House returns to Ministry of Sound on Saturday April 13 for the second instalment of its 2013, Season in London, this time with Dennis Ferrer, Noir, Copyright, Lovebirds, NICe7 and Santé taking control. Dennis Ferrer was last seen performing for Defected at the London NYE show and Noir’s ‘In The House’ mix collection was named Album of the Month and labelled “essential” by Mixmag. Opening the Box is Copyright, whose Copyright Recordings imprint continues to impress with S.Chu’s ‘Oh My’ being made Record of the Week on Radio 1Xtra, while their own recent ‘Lifted’ EP continued their impressive vein of studio form. Formerly one-half of Knee Deep, Lovebirds was responsible for arguably the biggest vocal record of 2011, ‘Want You In My Soul’ feat. Stee Downes. Italians NICe7’s five-track ‘Back To Basics’ EP on Noir Music last year went down well, with remixes of two of the key tracks – ‘Bassline Soldiers’ and ‘Time To Get Physical’ – due out on Defected in the next few months. Also performing is Berlin’s Santé, probably best-know to fans of Defected through ‘Homegirl’. Completing the line-up in the 103 is one of Ferrer’s protégées, André Hommen. Part of the administrative and creative team behind Dennis Ferrer’s New York City based Objektivity imprint, Hommen is now an established DJ and producer in his own right. Get into the mood for the event with Copyright’s latest In At The Deep End mix, just click on the link above.